Little Miss got a hankering for chicken pot pie the other day. I envisioned us making the pie together, but wouldn’t you know, she had to leave for an afternoon event, and I ended up doing 88% of the work myself. Same old story, amirite moms? So by the time we sat down to eat the pie, I was all, “I’m never making this again!” It was a lot of trouble. But then it was so delicious, I may have to revise my stance. Maaaaaybe I’ll make it again, but only if someone else does 50% or more of the work. The best part was our nine-year-old lapped it up without a word. He’s very suspicious of new recipes and also usually complains about vegetables all mixed up together (Onions?! How could you?!). The crust did fall apart—you can see it’s laid on top in wedges—but who cares? It really was fantastic, and you would never guess in a million years that it’s gluten free. A few notes on the recipe. I didn’t have any tomato paste and wasn’t sure I wanted it in the pie anyway, so we skipped that and didn’t miss it. Also didn’t have peas (skipped) or heavy cream (substituted milk) or sherry (substituted white wine). No problemo! The recipe as in the book How Can It Be Gluten Free? doesn’t seem to exist online, but if you follow their recipe for a single GF pie crust here and the filling part of the recipe for chicken pot pie here, you’ve basically got it. Just use the America’s Test Kitchen gluten-free flour mix instead of all-purpose flour in the filling and you’re good to go. If you’re not gluten-free, you can just use the original ATK recipe, obvs. Happy New Year! Hope your holidays were great. I’m glad to be gearing up for our regular routine and looking forward to doing a little culling of books, clothes, toys, etc. Lately, I seem to have lost my cooking mojo again. The peanut gallery is wearing me down. They want a rotation of about four meals (that we all agree on) and when I repeat one of those, there is complaining. We have instituted a new no complaints policy, but still, I’m at a loss as to what to cook. I’d rather not have to coax them to eat each bite. Not to mention that I’m sick of those four meals. Sometimes I just stare at the refrigerator as if inspiration will strike. Ever have those days? Usually I think of my kids as being fairly adventurous, and maybe they are, on the whole. Maybe they’ve taken a break. At any rate, the other night, I decided to take a break from worrying about what they wanted. I found this recipe in Crescent Dragonwagon’s Bean by Bean (yes, that’s her real name—look it up). I decided I’d make it for the hubs and me, and the kids could make themselves some eggs or PB&J. 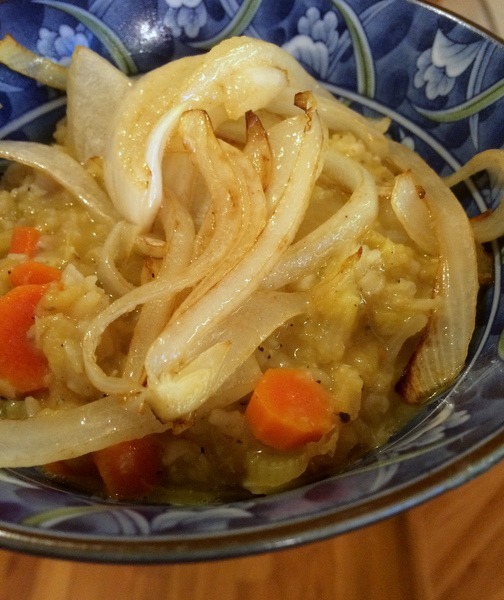 Mjeddrah is a Middle Eastern rice and lentil dish with spices, carrots, and onions. It sounded so lovely and comfort-foody but also interesting and nutritious. It’s a definite repeat, though I have to say, I would double the recipe for us. Ms. Dragonwagon recommends it will feed 4-6, but I could’ve eaten the whole pot myself, seeing as how we had no side dishes. Unless, maybe we had spinach salad. I may have cooked my spinach into the mjeddrah. Not sure. There were no leftovers, and only two of us ate it. Anyhoo, what are your tricks for feeding the whole family peaceably (besides takeout, of course)? I’m looking into some various meal prep menus or services to get us out of our rut. For other cooking posts, click here. Attention, spice lovers! It has come to my attention (via a New Orleans bookwoman friend) that there is a better, cheaper way to supply yourself with unlimited pickled jalapenos. 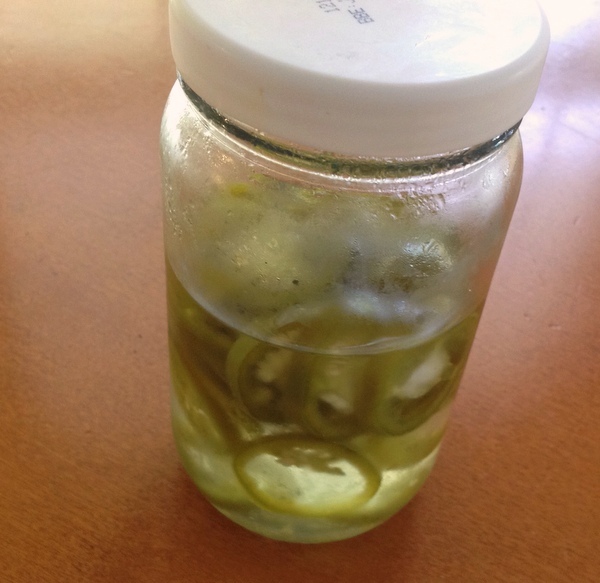 Simply buy fresh jalapenos, slice, and jar in white vinegar. Store in fridge. Tada! That’s it. Hubs was afraid that leaving the seeds in was going to result in scorched tongues, but turns out the vinegar must dampen the burn factor, because they’re really not that hot—I would put them in the same category as your average “medium” salsa. The best part about making these is that they retain an excellent crunch factor. 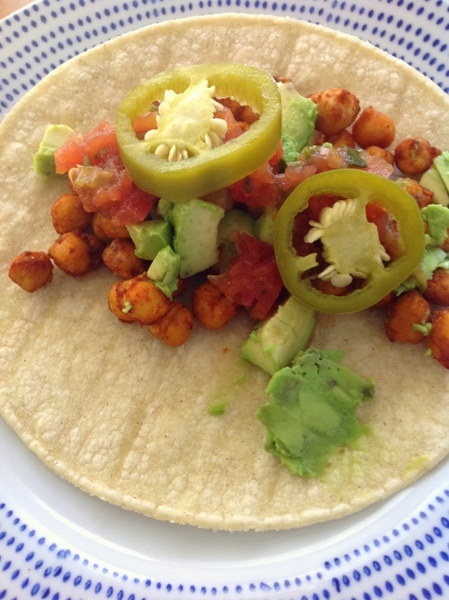 Here they are on my lunch from yesterday, also featuring roasted chickpeas using Penzey’s taco seasoning mix. Yum! In other news, I’ve discovered some new-to-me podcasts lately: Mystery Show and Grownups Read Things They Wrote as Kids, both wicked excellent. Also re-read Edward Eager’s classic Half Magic –so fun! And currently re-reading Pat Hutchins’ The Mona Lisa Mystery. It’s out of print but I found a library discard available online. Hope you’re having a great summer. As usual, mine is a little busier than I’d anticipated, but it’s going well. Hope to see you here again before long. I’d been planning to make these for forever, and an emergency shortage of packaged tortillas (egads!) pushed me to action. This tortilla press was a wedding gift, lo these many years ago, but I’d only ever used it to make white flour tortillas. 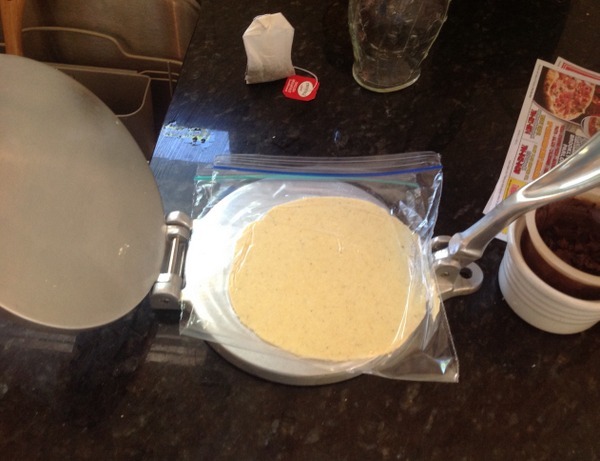 Turns out making corn tortillas is even easier and mega fun. Like magic! I used the recipe from America’s Test Kitchen, found here. I didn’t involve the kids this time, but it would be a perfect kid cooking project, with all the satisfaction of a Play-Doh factory. Very close to meeting my writing goals for the season (which ends when the kids get out of school). Crossing fingers! For more posts on food and cooking, click here. New-to-me podcast: Extra Hot Great. If you like roundtable discussions of pop culture, a la Pop Culture Happy Hour, you might enjoy this one, which is all about television. Somehow I can’t get enough of smart tv analysis. Something about this winter (is it over? can I put it in past tense now?) made me eager to try all sorts of things from scratch. I think it was all the snow/ ice days and delayed entry school days. Once I found a recipe for gluten-free gnocchi, I couldn’t stop thinking about it. Turns out making gnocchi isn’t that hard, and assuming you have a high enough threshold for mess and imperfection (lucky me! I have both! 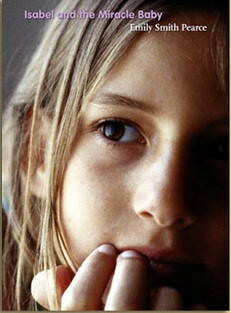 ), it’s a great project to do with the kids. It’s a little like making snakes with play dough, with just a slightly higher level of skill needed. 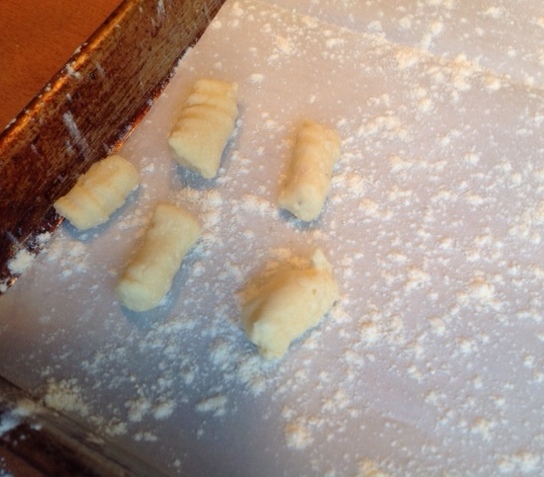 Making gnocchi is way easier than rolling your own pasta (which is fun but exhausting), so I think we’ll have to do it again soon. I’d intended to use the quinoa-ricotta gnocchi recipe from Aran Goyoaga‘s Small Plates and Sweet Treats, but there seemed to be an error in the recipe, so I found this recipe through a Google search. If you don’t have to worry about gluten, the link recipe can be g-free or not, and I’m sure there are lots of other ricotta gnocchi recipes out there waiting for you. A few notes on this particular recipe. One, I decided to double it, which worked fine. I froze some of the raw gnocchi to cook and eat later. Two, the raw dough tasted…um, not good would be putting it mildly. We were all worried the end result would be inedible. Strangely enough, though, when it was cooked, the gnocchi was delicious. We enjoyed it with our standard favorite tomato pasta sauce (we double a Williams-Sonoma recipe similar to this one and freeze half, so we had it on hand). This whole process was a big hit with the kids. 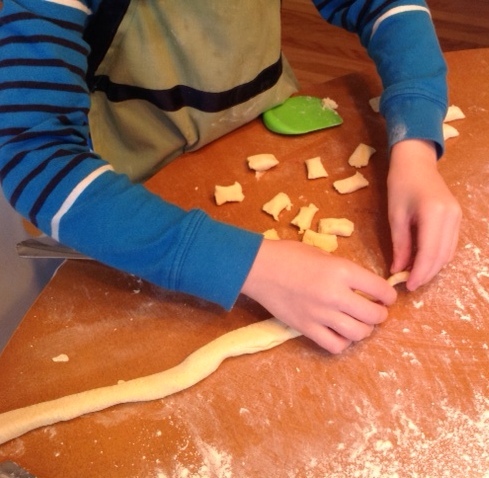 They found it a little tricky to roll out the snakes, as it takes a very light touch, but with a little help, they were more than happy to be my little gnocchi factory for the afternoon. Btw, we also recently made gluten-free hand-rolled pasta. It was a frustrating process, with lots of setbacks, but I will say the recipe (from this book) was downright fantastic, better than our last attempt, and I doubt you’d know it was gluten-free if I didn’t tell you. At one point I thought, this is so hard I’ll never make it again. But then, I tasted it. If you’re going to go to the trouble, try this recipe. 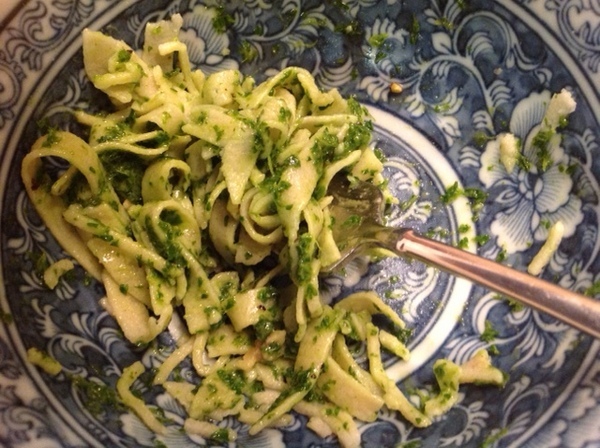 I ate it with Mark Bittman’s recipe for parsley pesto, which was delicious. 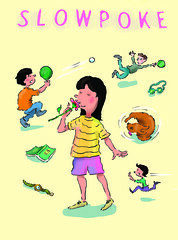 Just finished Dear Committee Members by Julie Schumacher. Very funny, especially for writer types. 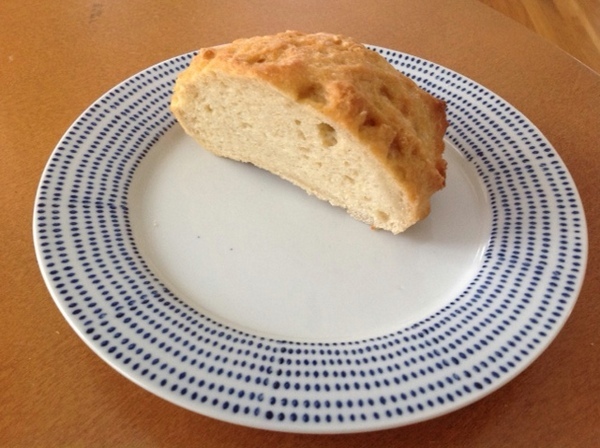 If you’re not gluten-free, you may want to skip this one, but I’ve been baking a lot of different GF breads lately and thought it would be worth sharing the results. 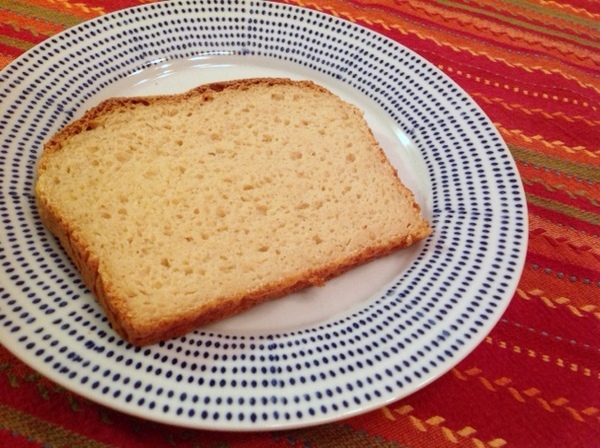 First off, let me say, I was a real skeptic when it came to making gluten free yeast breads in particular. Even the best GF breads on the grocery shelf are so mediocre that I’d pretty much given up bread entirely. There IS a local bakery that does GF loaves once a week, and they’re excellent, but I was doubtful I could bake anything at home that would come close. I’m happy to say I stand corrected! It’s totally worth making GF bread at home because it’s more than ten times better than the stuff you can buy off the shelf. Another nice thing is that since there’s no gluten (sorry I can’t give you the chemistry lesson on this) you don’t have to knead the bread, which means a little less mess and work. It’s true that GF breads have loooong ingredient lists. That kept me away for a long time. Once I’ve figured out our favorite recipes, I plan to make up some dry ingredient mixes so getting started isn’t so tedious. This recipe was the reason I bought the book. When the ATK folks talked about it on…was it The Splendid Table? I was impressed with how much research they’d done and the many variations they’d tried. Still, when I saw the picture in the book, the texture looked impossibly light and good-looking. Could it really work that well? I’m happy to say that yes, this bread is absolutely excellent, and I doubt if I served it to you you’d have any idea it’s gluten-free. 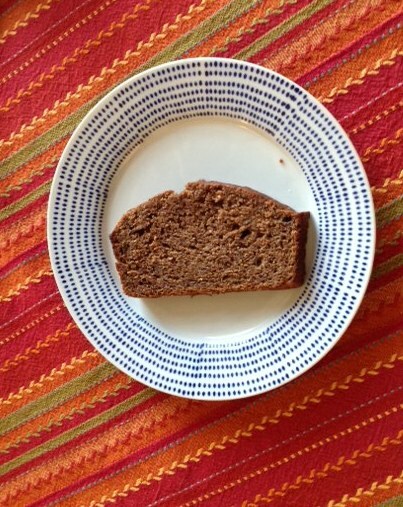 My seven-year-old says it tastes like “Earth Fare” bread, by which he means, it tastes like regular gluten bread that comes from the local grocer’s fresh bakery. Definitely worth making. Recipe here. The book is centered around a DIY GF flour blend that you use in most recipes. A neighbor friend told me about this mix (available locally at Earth Fare) and how it can actually be used in the bread machine. I’d never heard of making GF bread in the bread machine and in fact was on the verge of giving ours away when she told me this. The mix isn’t cheap, but then, it’s still cheaper than pre-packaged bread, and you can use it for muffins, pancakes, and the like, too. I thought it turned out very well. It didn’t rise much at all, but my neighbor tells me this is normal. The texture was a little bit denser than the ATK version, but it was still quite good, and the flavor was good, too. Definitely worth using if you want to use your bread machine. This bread is my favorite. It’s nice and crusty, the closest thing to a European rustic-style loaf, and I’m like, “Where have you been all my life?” Really wonderful flavor and texture. It’s so good that I sometimes take a bite and wonder how it’s even possible without gluten. 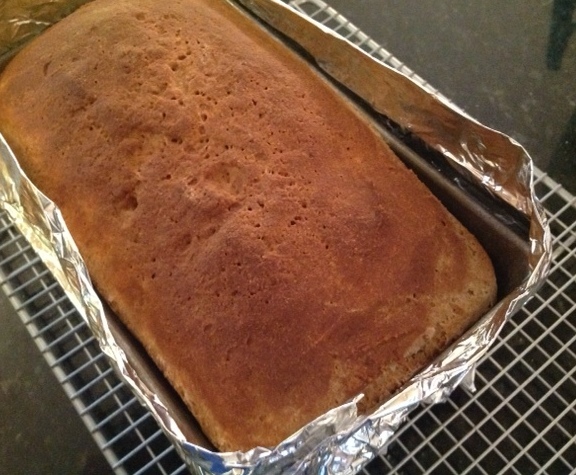 It looks and feels like a white loaf but does have whole grains in it. I can’t wait to try their new cookbook, which is all gluten-free. An added plus is that you make the recipe in a quadruple batch, so you have a nice output for your effort. My little guy likes to form the loose loaves on parchment paper. Here’s the recipe for you. Anyway I really liked this banana bread. It has a nice touch of earthiness from whole grain and nut flours, and my little guy just loves it. Sorry—doesn’t look like the author has posted the recipe online, but here is a similar recipe of hers that’s for banana chocolate cupcakes. One note—I halved the sugar, and it was plenty sweet. I did try another bread in the book (seeded bread) which, sadly, didn’t rise, but I’m thinking that was a problem with my yeast. Besides cookbooks, lately I’ve been reading Overdressed: The Shockingly High Cost of Cheap Fashion, also a couple of new-to-me blogs: Refashionista (hilarious adventures in making over horrific thrift store finds) and Toxic Beauty Rehab (natural beauty products). 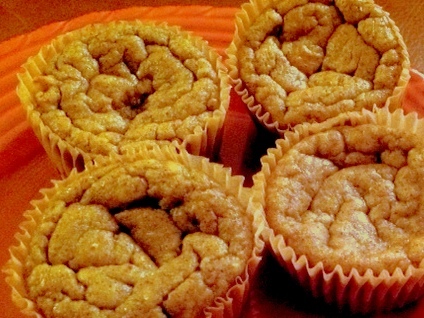 I was looking for a muffin recipe with a little more stick-to-your-ribsyness, a little less white flour and found this one on Pinterest, thanks to Amanda of Running with Spoons. The muffins are made with a little oatmeal (I used GF), almond meal, almond butter, and bananas. One slight issue: the recipe is for 9 muffins, and I really wanted 12. So I added a little more this and that to extend the batter. An extra banana, an extra egg, a couple spoonfuls of plain yogurt, a little extra almond butter and almond meal. I also added 1/2 tsp baking powder in the hopes that I could get a little higher rise. Plus a little splash of water when my blender was having trouble mixing everything up. I didn’t have the ground flax seed on hand, but I’m sure that would be a nice addition. These were very easy, and I felt happy about getting some protein and fiber in while still serving something yummy. The muffins did rise nicely when they were in the oven, but once they started to cool, the tops deflated. They’re not dense or heavy in any way, though, so in the end their relative flatness didn’t bother me. These are a definite repeat, though I may continue tinkering with the ingredients. For more of my cooking and eating adventures (including lots of gluten free stuff), click here.